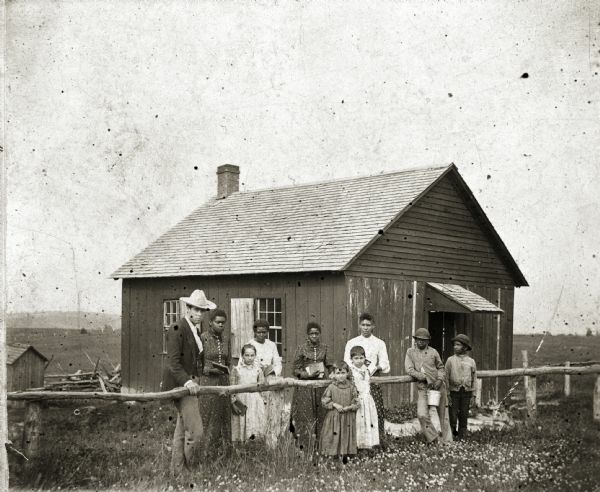 Schoolhouse of District #5 in Pleasant Ridge built on land donated by Isaac Shepard. Both blacks and whites built, attended, and taught at the school. People pictured include: F.J. Webb (teacher), Rina Gadlin, Bessie Hoffman, Nettie Gadlin, Cora Sheppard, Jennie Hoffman, May Hoffman, Emma Green, Oscar Gimes, and Lester Green. Image restricted. Reproduction requires written permission from Cunningham Museum. Original photograph held at the Cunningham Museum in Platteville, Wisconsin.